Here is the list of the top 10 most popular artists based on auction records in July 2008, as compiled by Artprice. In spite of the state of the world's economy and complaints of dropping art sales from top auction houses such as Christie's and Sotheby's, here's a quick look at some not-so-starving contemporary artists who are bringing home a fat paycheck for each work of art sold. 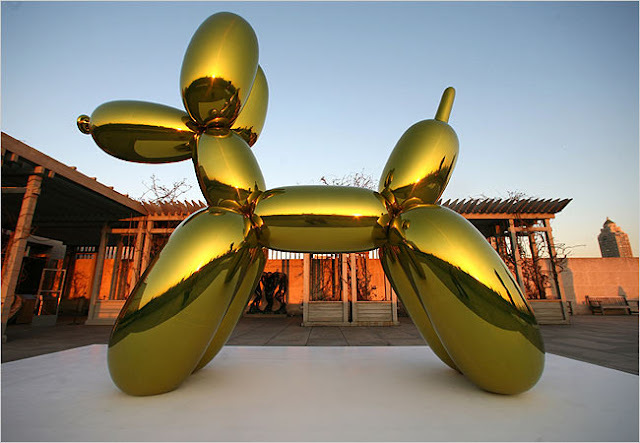 Out of the top 10 money-making artists the first four are Western: Jeff Koons (b.1955), the celebrated American self-taught sculptor and mixed-media neo-pop artist; Jean-Michel Basquiat (1960-88), the Afro-Caribbean-American painter and ex-graffiti artist; Damien Hirst (b.1965), the British sculptor, mixed media artist noted for his dead shark (The Physical Impossibility of Death in the Mind of Someone Living) and diamond encrusted skull (For the Love of God); Richard Prince (b.1949), the American painter and photographer. But the rest are Asian. Type of art: Sculpture, mixed-media, installation art, winner of Turner Prize. Sales at auction (07-08): £45.8 million. Note: The survey excludes Hirst's Sept 2008 auction of £100 million. Both the two main international fine art auctioneers, Sotheby's and Christie's, hold regular auctions of post-war modern and contemporary artworks. Recently, the British contemporary sculptor and installation artist Damien Hirst broke the salesoom record for a single artist with his £111 million auction at Sotheby's (Set 2008).